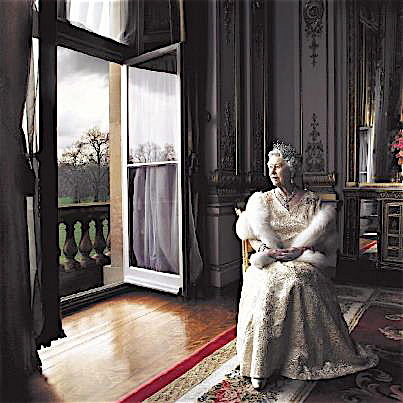 I found another of the celebratory photographs of Queen Elizabeth made for her 60th Anniversary. Given the significance of the event and the mystique that still attaches to royalty -- the British royal family in particular -- I assume a fair amount of symbolism to be part of these images, as in the Renaissance paintings photographer Thomas Struth studied before creating the shot I featured in my last entry. In that photo the idea seems to be a gracious, slightly casual welcome by the Windsors, Elizabeth and the man without whom she has said she wouldn't have been able to do the job, to all. I don't know the name of this picture's photographer, but this one is different, more formal, the stakes are higher. This isn't Mrs. Windsor but HRH the Queen, tiara in place, fur stole, major jewelry and an important gown. She's alone. Her body faces the viewer but she's fixed on something outside, the fact we cannot see it serving as an invitation to speculate. Whatever it is, she's smiles calmly, meeting it with a steady gaze; she doesn't consider it intimidating. The past? Possibly; it's an anniversary and a good time to look back and evaluate. From presiding over the dismantling of the British Empire to rebranding the family to a point where the future Queen can buy her own groceries at the local super market, Elizabeth has engineered and/or adapted to enormous social change. She found herself in the royal succession because divorce was considered scandalous and totally impossible in the royal family, but personally approved the divorces of her sister and three of her own children. The children two generations below hers openly and warmly refer to her as Granny in public. The present? Again possible; the family is at a height in its popularity these days; while stressed, the UK is hardly in the pre-disastrous situation of so many other countries. The future? The trees outside are bare, the sky gray, the light coming in the window is cold. It's autumn, herald of the end of the year and, by association, reminder that for her many things will be ending. Perhaps not soon (her mother made it to 101 and a half years of age after all) but inevitably. If that's what's in her mind, she contemplates it calmly. Or perhaps she's just thinking that it's typical English weather. This graph appeared on the web without a great deal of provenance. That said, from what I've read of history, it seems reasonably accurate. The Greek bar probably should show a rather higher angle because of their great achievements in mathematics (which the Arabs recognized, admired and upon which they built in major ways) but in general, as a talking point, it will do nicely. Ever and as always, the massive Muslim contribution to mathematics, medicine, pharmacology, optics, geography, astronomy, water management, engineering, botany and the preservation of knowledge via the translation of classic works -- all that is totally ignored. That and an international book copying and publishing industry aided by the mass production of paper and a network of amazingly modern libraries, many of which contained a quarter to a half million volumes at a time when libraries in Christian Europe might contain two or three dozen. There was a book by Thomas Cahill, written from a typically Eurocentric, Christiancentric perspective, called "How the Irish saved Civilization" that credited Irish monks with copying books (probably a good three to six months for one sizable book) to preserve their contents. Arab scribes who were trained for speed and concentration, aided no end by the flowing Arabic script and the smoothness of paper versus the rougher texture of parchment, could copy a book in two to three days. With hundreds of them working, shipments to libraries and book sellers throughout the Muslim world went out frequently. And authors benefited from an early version of the royalty system. 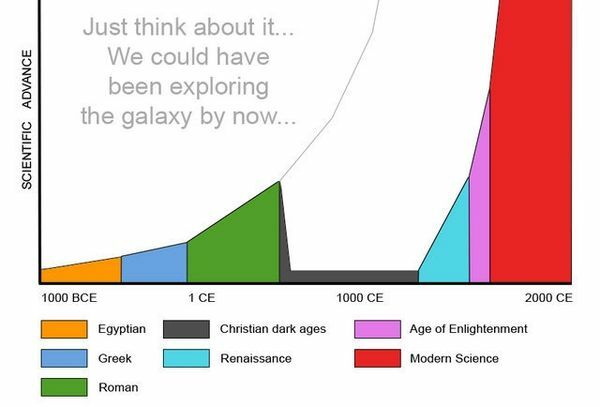 The catastrophic decline of knowledge and achievement during the Christian Dark Ages was largely self-induced. Most of the great Greek and Roman libraries were burned because they were pagan and therefore filled with lies and works of the evil, according to the bishops and popes who ordered their destruction. (As late as the 1400s, Catholics were still burning libraries. When Ferdinand and Isabella took possession of Granada on January 2, 1492 from the last Muslim ruler in Spain, one of their first actions, the very next day, was to have the approximately 500,000 volume library taken out of the Alhambra palace and burned in the Plaza Bib-Rambla) . Medicine faltered, construction techniques reverted to primitive stone upon stone building with the sophisticated lightweight Roman concrete formulas gone. Religious superstition replaced provable science. The same thing could happen today, here. There are people working to make it happen. Although perhaps not well known to most Americans, Tianjin is China's sixth largest city with a metropolitan population of some thirteen million. Another center like this is being built across town in a different district. The boom in China is similar to the one fifty years ago in the U.S. when arts centers, many conceived in the highly-publicized wake of Lincoln Center in New York City, sprouted up all over the U.S. 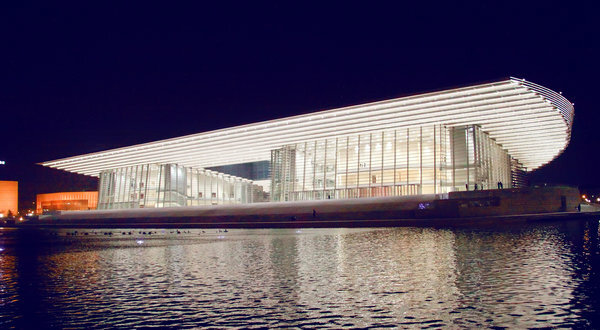 The design of the halls all over China (the strikingly handsome opera house, above) is an indication of the tremendous interest in and influence of Western art forms throughout eastern Asia. Classically-trained singers, instrumentalists and composers are now spread throughout the world in symphony orchestras and opera houses. Korean soprano Hei-Kyung Hong has been a renowned member of the Metropolitan Opera for decades; Madame White Snake, a strikingly beautiful opera by Chinese-American composer Zhou Long was premiered in Boston and won the Pulitzer Prize for opera in 2011 to give just two examples. American and other Western artists are welcomed by China to perform and to give master classes. Chairman and Madame Mao's Cultural Revolution that stunted Zhou Long's musical education until he could get out of China and study in the West, is long gone and discredited. Every now and again a squirrel will explore the planters that are built onto the front of the house and look up to see the tall glass windows that make up the house's southern facade. Sometimes they chin themselves on the window sills and peek in. When Starr is in the room, this can result in nose to nose confrontations through the double pane glass. The other day when one was going on, I grabbed my camera and walked over to the window. The squirrel decided to check me out nose to nose and quickly climbed up the side of the window frame to get a good look, allowing me to do the same. Queens, Chinese, squirrels - what don't you cover? One just has to wonder how the "religious" will work to hamper progress.